Jewish Voice for Peace (JVP) is a grassroots activist organization campaigning for justice in Palestine and against Islamophobia, antisemitism, and other forms of racism. Haymarket spoke to JVP representatives about their work and their forthcoming book, On Antisemitism - available here with a 40% discount. Thanks for joining us. First of all, could you say a little about Jewish Voice for Peace (JVP) and what you set out to achieve? 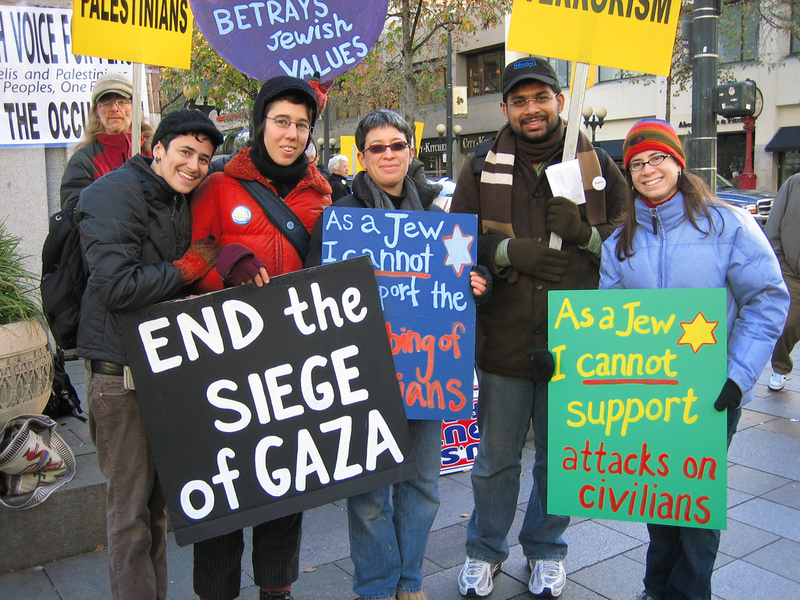 Jewish Voice for Peace started in 1994 as a campus-based group at UC–Berkeley. Over the years, we’ve grown into a national organization that primarily aims to challenge US policy and public support for the Israeli occupation of the West Bank, Gaza Strip, and East Jerusalem, and also campaigns for a just solution for Palestinian refugees based on principles established in international law and stands for peace and justice for all peoples of the Middle East. We’ve grown enormously over the past decade—in 2007, our National Member Meeting had only around seventy-five attendees. We are about to have our fifth National Member Meeting and we expect over a thousand attendees. Haymarket Books is really excited to be publishing a book put together by JVP, On Antisemitism. Why do you think it’s particularly important to publish something on this topic now, and how does the book contribute to our understanding of antisemitism? We started working on the book well before the current [Trump] administration, because much of our base and many of our allies were really looking for resources on antisemitism that didn’t equate it with criticism of Israel but did take it seriously as a form of bigotry. It felt important to produce the book as an anthology, because so much of our work is coalitional, and we didn’t want one authoritative voice dictating what antisemitism is and how it works. It was also crucial to us that we include those who have been completely marginalized by mainstream discussions of antisemitism: for example, Jews of color and Sephardi and Mizrahi Jews, and activists who are unfairly smeared as antisemites because of their advocacy for Palestinian liberation. Of course, the election of Trump and the rise of the alt-right to mainstream politics made the topic feel even more urgent. It’s been a strange experience, to say the least, seeing some mainstream Jewish organizations excuse or justify the antisemitism of people like Steve Bannon and others emboldened by Trump. How do you account for the convergence between traditionally highly antisemitic groups on the Western far right or alt-right with contemporary Zionism as represented by the Israeli state and its advocates? Several essays in the book highlight that it is unhelpful to think of antisemitism as a kind of eternal, ahistorical form of discrimination and oppression. Like racism and sexism, it manifests itself differently in different historical periods. Of course, antisemitism is expressed differently today than in the 1930s, and it is expressed differently in the United States than in Europe or elsewhere. The alt-right represents a backlash to a certain kind of progressive inclusivity. They are the most extreme confluence of those who ask, “What about white history month,” “what about men’s rights,” “why don’t we have straight pride?” Sometimes the people asking those questions genuinely don’t know the history, or don’t understand how power works, but some see the enfranchisement of women, queer and trans people, and people of color as threatening to whiteness, heterosexuality, cis people, and men. The way antisemitism is expressed in the alt-right fits into this, because so much of the alt-right’s antisemitism is cloaked in a kind of ironic humor, making it hard to tell whether the person is joking or not. And that allows them to get away with so much more. One of the major lessons of this current era, which seems to be playing out publicly, is that you can be antisemitic and Zionist. For too long, a “love of Israel” was used as a barometer to gauge whether someone was antisemitic. But there are antisemitic groups who see Israel as either a great example of ethno-nationalism, or as a way to rid the United States of Jews, or as a step towards the Second Coming. Equally, love and respect for Jewish people is not in contradiction with vehement objections to the repressive policies of the State of Israel. A “love of Israel” is not and has never been a good way to measure antisemitism. As you mentioned before, false charges of antisemitism are often used to close down debate on Israel and Palestine. Does this make it more difficult to identify and fight genuine incidents of antisemitism? Zionism is a political ideology. Anti-Zionism can mean many things, but overall, it’s opposition to that political ideology. Antisemitism is a hatred of or bigotry toward Jewish people. Absolutely, politically motivated charges of antisemitism make it much harder to combat the real thing. If criticizing the Israeli occupation, the apartheid wall, checkpoints, and the sanctions against Gaza are all antisemitic, then what is antisemitism? In our activism, we must always be vigilant for cases of real antisemitism, just as we need to do more to make sure our movements are free from all forms of bigotry and oppression. How do you see the next few years developing politically with regards to the issues JVP are concerned with, both in the United States and in Israel/Palestine? We are about to go into three days of our biennial National Member Meeting with over a thousand members coming from across the United States. Despite the state of our country, I feel a tremendous excitement brewing. It seems clearer than ever that the governments of the United States and of Israel are not working democratically for all of their residents, and there’s a true opportunity to build a large, grassroots movement for a better future. Finally, how can people find out more about you or get involved? Our website — jewishvoiceforpeace.org — is an excellent place to start! We have over seventy chapters across the United States, and various councils for academics, rabbis, artists, medical workers, and people in the labor movement. Our work is grounded in grassroots, local relationships, and we bring our values of justice and equality for all people to our organizing work both on- and off–line. In the aftermath of the 2016 presidential election, we put together a digital training series called “Ready to Fight,” which went over some of the nuts and bolts of organizing, and we had a fantastic response—hundreds of people got to hear experienced activists explain how to de-escalate, how to put on creative and engaging actions, and how to combat Islamophobia, among other topics. We are also growing our national legislative organizing, which includes training chapters in how to communicate effectively with their representatives and continue to participate in BDS campaigns on the local and national level. This year, one of our key priorities is deepening our work against Islamophobia. This includes working through our Network Against Islamophobia to produce a free community education curriculum, posters for canvassing, and local campaigns targeting Jewish institutions that fund anti-Muslim hate groups. On Antisemitism is available directly from our website with a 40% discount, for a limited time only. Purchase the book here. JVP's annual National Member Meeting takes place this weekend, 31 March to 2 April, in Chicago. Click here for details.